Idolatry came into the world soon after the creation of man. [i] Idolatry does not simply mean worshiping a stone or some object. Idolatry means worshiping, praying to, or spiritually serving anyone or anything other than the one infinite G-d.
Chi is a basic concept found in Indian, Chinese, Japanese, and many other Eastern cultures. It refers to a "Universal life force" or an "energy flow". 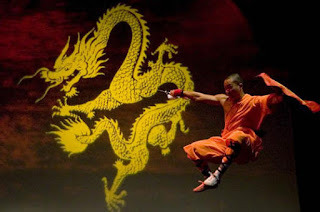 It is found in their spiritual teachings, alternative medicine, "energy healings", and even in their martial arts. Superficially, one might think that it is a proper spiritual concept. After all, the Torah teaches that Hashem is the Life of all of us. But as you look deeper you see that they are not talking about the Infinite One. The problem with conceiving an energy within the body, or anywhere, is that you will come to focus on a nonphysical object other than Hashem. Hashem is the life force within us since He is the One Who fills and surrounds all. When you focus on an energy, even an imagined energy, that "energy" can become palpable, very strong. It can then possibly be felt by others when you direct it towards them with your thoughts. They then imagine that that feeling heals them, or elevates them spiritually, or it can even physically knock them over. As you conceive of this "power" the process is embedding in your mind the borders of a spiritual force other than Hashem. In the beginning you will control this "wondrous power", but in the end it will control you! "Blessed be the Life of all the worlds" is said in the after-blessing for eating certain foods. Hashem is the Life force in all... not some power that moves. Whereas the chi is said to need harmony, moves around the body, and can be increased or decreased, Hashem is Infinite, everywhere at once. He does not move. There is no balance in Hashem, only in His creation. Hashem is the only spiritual "force" and it is Him that you should be focusing on. As for your martial arts, you can do almost any of the physical forms that you want as long as they have NO references to any system that has spiritual roots. It is not the physical forms that are the problem but the spiritual teachings that always come with them. In the 1950's I attended a karate class on Okinawa where the teacher taught that after becoming a 5th degree black belt (a very high degree) you will learn how to call on spirits to help you break blocks with your bare hands. Again, the physical moves are almost never the problem. The problems come with any and all of the spiritual information that almost always comes with these systems.